Sony has issued a double bill of action-comedies starring Martin Lawrence. In ‘Blue Streak‘ (1999) Lawrence stars as a jewel thief who just hit the big time by stealing a huge diamond. In the last moment before getting caught he hids the gem in a building under-construction. After two years in jail, he comes to find out that he hid the diamond in a police building. Lawrence’s plan to get his diamond back is to pose as a LAPD detective. Bad thing to his plan is that they LOVE him – due to his special keen mind specialized into the criminal focus- and he is catapulted from one success into another, making him more and more prolific inside the force! The movie makes obvious why Lawrence is on top of his game, due to his acting, his arrogance as well as his cartoony over-the-top character-inventions. ‘National Security’ (2003) follows the adventures of Earl and Hank, who have only one thing in common: they’re both L.A.P.D. rejects. One just got kicked out, the other can’t even get in.To make matters worse, Earl (played by Martin Lawrence) is kicked out of the academy and is the sole reason that Hank gets kicked out of the force. Earl is arrogant, obnoxious and RACIST even and Hank looses big and looses all. When they encounter each other later, despite being damned to the lowest rung of the law enforcement ladder as lowly security guards, the sentiments on both sides are still shaky at best, yet the universe made them form a team in which they uncover a sophisticated smuggling operation. This flick is borderline crazy, labile, racist and over the top as with all of Lawrence’s appearances yet it entertains highly! C4S verdict: This 2-movie-pack makes for one funny action-filled rump I did love to see! Martin Lawrence is funny in his best moments yet too silly in his low-level jokeries, but the action makes for a nice balance! You do have to like Lawrence otherwise this double-feature will NOT be for you! Thanks to Sony Pictures for the review copy. 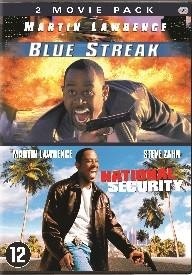 Blue Streak/National Security ‘Martin Lawrence’ 2 DVD Pack has been for sale since Sep 11, 2013.